Everything seems to be ‘cloud this, cloud that’ these days. So it was inevitable that pixels would sooner or later get in on the action. 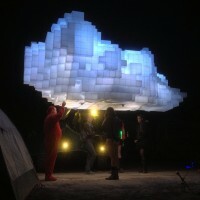 In this post, we’re talking about literal pixel clouds. Clouds made of pixels. In the sky. Let’s look at two examples. Like the examples in my previous post (“big pixels. labour intensive pixels“) , these are big, labour-intensive pixels too. But unlike the previous post, they are most definitely digital light. Read on. 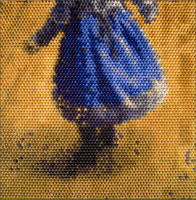 As usual, this post is about pixels, but it’s about as far from gigapixels and digital light as one can get. It’s no secret that I think pixels are important. 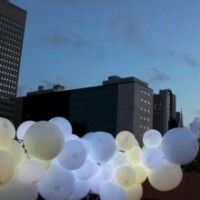 After all, soon they will be everywhere —interactive ones, tiny ones, covering huge areas. We’ll have the people who are working diligently behind the scenes to develop the advanced technologies needed to make this practical, easy to use, and affordable to thank. But low tech pixels can be beautiful, too –big pixels, huge pixels, giant pixels. Beautiful because they can be expressive and beautiful because of the labour and imagination it takes to create images with them. We’ve written about examples of big pixels in earlier posts (pixels you can hug, pixels that float). Today, let’s look at some old-tech, (almost) low-tech, and no-tech examples of big and sometimes beautiful pixels. And just for fun, I’ve tried to estimate the image specs as best I can. You can find many more examples of his beautiful work here. 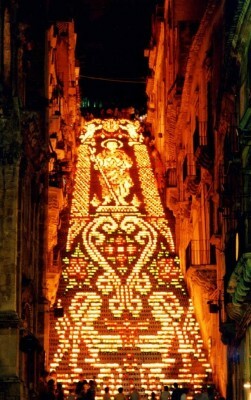 The picture on the left is of La Scala Illuminata in Caltagirone, Italy. The staircase was built in 1608 and is 142 steps (and thus 142 pixels) high. My guess is that it’s about 70 pixels wide. The pixels, as you can see from the photo on the right, are really candles. The display is shown yearly for two days in July and two days in August — a maximum frame rate of 4 frames per year ! You can find more information here. For quite a while now, I’ve been saying the pixels will be so ubiquitous that we’ll consider them to be a building material. It finally seems to be on the verge of happening and in a more literal way than I expected based on a link sent to me by Charles Fraresso. Lucem, based in Stolberg, Germany, has developed a light transmitting concrete product ( Illumni.co describes Lucem’s product in more detail here). The picture on the left is a building facade built using their product. The pixels are big! The photo on the right is the same building in daylight. Lucem’s blocks aren’t full thickness concrete blocks. They are thin sheets of concrete with optical fibers embedded in them to let light through. 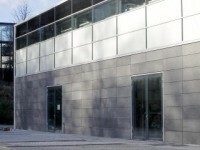 In effect, it appears that what Lucem offers is a concrete cladding that goes onto other surfaces. LED backlighting provides light source. Others in Germany have been working along similar lines. 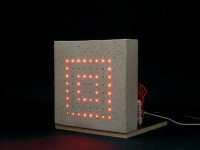 Dominik Kommerell and Angela Renz of the University of Applied Sciences in Stuttgart built a prototype of a pixelized concrete block, according to a post in designboom. Their prototype (shown on the right), is not a full sized concrete block but, instead, is intended to be used as a facade. 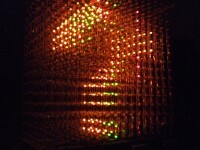 In contrast to Lucem’s whole block illumination, Kommerel/Renz’s block has 64 individually addressable pixels. 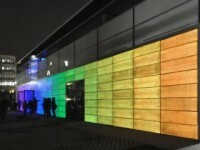 It was shown at the Media Facades exhibition way back in 2008. On February 2 this year, New York City’s Grand Central Station celebrated its hundredth birthday. Improv Everywhere staged Grand Central Lights for the occasion. 135 people, each with cameras and LED flashlights, stood on three rows of catwalks at one end of the station. They were choreographed to use camera flashes and flashlight movement to create a very interesting display. This definitely puts the labor in labor-intensive. It also takes the tech out of high-tech. There’s no denying it’s pretty, though. See the video below. I worry about what all these pixels will be used for. I mean, pixels everywhere is a lot of pixels if they’re really going to be everywhere, right? I’ve come across two people who are thinking about what pixels can do on a large scale. Architect Greg Tran (subject of a future post) is exploring new ways of seeing the world as it might be. British artist David Hockney points to new ways to see the world as it is. There was a recent article in Technology Review by Martin Gayford about Hockney’s work in this area. He writes about an array 18 HD displays (about 35 million pixels, which is a lot of pixels, I’m sure you’ll agree). The content was recorded on 9 cameras. Each half of the display shows the same moving scene but slightly displaced in time. So what? Well, with this simple idea, the viewer can see the scene as is it and as it just was. Or, thinking differently, you can effectively see the scene as it is, and at the same time see what it soon will be. That’s definitely is not how we look at the world now. David Hockney is a renowned artist and the Technology Review article looks at this work in that light. It is indeed potentially beautiful and enlightening. It’s also something potentially important as a new way of visualization. Imagine this beyond a puny 18 screens, but at room scale or larger. Hockney is looking at ‘everywhere’ differently. How many other exciting new ways will there be to view the world when there really are unlimited pixels available everywhere? Earlier this month I wrote about”Pixels Big Enough to Hug” which generated a lot of interest. I came across a similar giant pixel project called “Light Drift” by Boston’s Howeler+YoonArchitecture. It was shown in October 2010 in Philadelphia and again in Boston in May 2011. Very nice. There are a lot more photos on flickr. Now if one could only fully control each orb’s color…. it shouldn’t be too hard to do that! Pixels in more and more places — pixels everywhere! techniques including polarization switching, lenticular lenses, shuttered glasses, and so on. But if pixels are really going to be everywhere, why should they be restricted to just two dimensions? They don’t, of course, and people are experimenting with this. 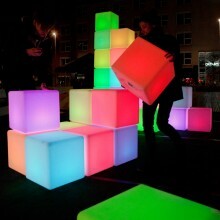 I was looking at hackaday.com recently and found this post about a 3D LED cube assembled by Brendan Vercoelen while he was a student at New Zealand’s Victoria University. His goal was to make a 16x16x16 matrix of red/green LEDs (4096 of them) but he stopped at 16x16x8. That’s still very impressive when you consider he built this by hand — each LED has 3 connections to it which meant he did a lot of soldering. The first video below is from his site. 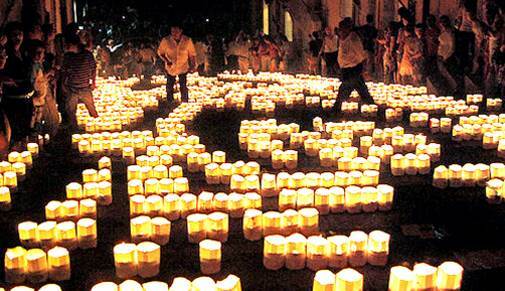 Others (experimenters and companies) are also exploring this. For example, Instructables.com tells you how to build a less-ambitious version yourself ( see 2nd video further down this posting). Seekway in China seems to be selling something similar using layers of LED curtains (perhaps readers who know Chinese can comment more about what Seekway is doing). Is this a practical 3D display? Probably not, but maybe that’s not the point. Maybe it’s simply a new and different way of expression, one more part of the digital light future. Humbly admitting to a bit of narcissism, I googled ‘pixels everywhere‘ recently and stumbled upon ‘Pixels Motel Mozaique‘ by Dutch designers Jonas Vorwerk and Yoren Schriever. These indeed are (huge) pixels everywhere! I’m used to thinking about pixel sizes in fractions of a millimeter —these ones are fractions of a meter. In a world of megapixels, this site had decapixels (I understand they used just 50 pixels). There’s a brief description of how the pixels work here. Each pixel’s color and brightness can be changed by tilting it (there is an accelerometer in each one). It certainly looks like people are having a lot of fun and it is pretty. Yoren Schriever on his site mentions that each cube has a data port and “…this port can also be used to communicate with the firmware, making it possible to send color commands to the cube, or read the accelerometer values from it“. Maybe it is possible. I wish I could have seen it in person. Great work, Jonas and Yoren. Thanks for inventing a new kind of interactive pixels. Who would have thought of pixels you could pick up and hug? I really, really like this.